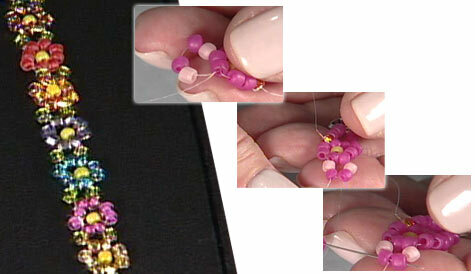 You will need to use three different seed bead colors, so you can see the pattern form. The flower color is A, the center of the flower is B, and the leaf color is C.
Cut a piece of thread (Nymo® or FireLine™) to a comfortable length for you to work with. Add a stop bead to the end of your thread by running the needle and thread through the bead a few times. Be sure to leave a 6-inch tail. Almost double your thread to make it easier to work with, but do leave a tail so you are working with only one thread. Run the needle and thread back through all the beads, starting with the first A bead (the stop bead is not part of your pattern) and exiting through the last A bead. Pull the thread through, creating a circle. The thread will be exiting the circle from between two A beads. Bring the needle back to the first seed bead of the circle you made. Run the needle and thread through two of the beads in the circle. As you pull the thread through it will form a half circle with the B bead in the center. Pass the needle and thread through the seed bead closest to the B bead in the center of the half-circle. As you pull the thread through, you'll see the beads form a daisy. Bring the needle to the opposite of where the thread is exiting the daisy. Pass through two of the seed beads in the daisy. As you pull the thread through, the beads will form a little loop. Turn the entire piece over. Pass through one C bead and one A bead in the loop. As you pull the thread through, it will exit between the two A beads of the loop. Repeat Steps 3 and 4 until you've reached the desired length. Once you have added the last flower segment, you need to add a loop for the last half of the clasp. Bring the needle to the opposite of where the thread is exiting the last flower segment. Pass through two of the seed beads in the daisy and pull the thread through to create a loop. Knot the thread between two seed beads. Add a dab of glue to the knot and trim the tail.